The Fair Workplaces, Better Jobs Act, 2017 (Bill 148) introduces many important changes to address Ontario’s outdated labour laws. The proposed changes in Bill 148 to the Employment Standards Act (ESA) and Labour Relations Act (LRA) provide a good start to addressing precarious work to deal with changing workplace practices. However, we join with the Workers Action Centre and Parkdale Community Legal Services in calling for amendments to Bill 148 to ensure it can close the gaps and raise the floor of minimum standards for the highest possible number of workers in Ontario. In particular, we call on the Committee to make the necessary amendments to ensure that workers have notice of their schedules and are compensated when the shift is cancelled at the last minute, and to ensure that the equal pay provisions can meet their goal of alleviating the unfair treatment of part-time and temporary agency workers. End employment standards exemptions: Only one quarter of workers in Ontario are completely covered by the minimum standards due to a complex web of exemptions. The proposed legislation does not address these exemptions, instead leaving the issue to a recently announced and separate process. Many migrant workers fall within these exemptions. The Employment Standards Act sets the floor for the most basic workers’ rights – all workers should enjoy these rights and Bill 148 should simply eliminate exemptions that apply to migrant workers. In the alternative, Bill 148 should be amended to include a narrow definition of the circumstances in which an exemption will be available in order to better guide the separate review of exemptions. Stop illegal recruitment fees: In 2009, the provincial government took an important step by prohibiting recruitment fees. However, there are ongoing reports of recruiters demanding exorbitant and illegal fees from migrant workers. Effective enforcement and mandatory registration for recruiters and employers is required to ensure that migrant workers can take home their pay. Effective enforcement requires protection from repatriation for migrant workers: The important gains in the proposed legislation will be illusory unless enforcement is strengthened. MWAC welcomes government announcements about significant increases to enforcement resources. We urge the government to consider the particular vulnerabilities faced by migrant workers, who face immediate repatriation by unscrupulous employers if they complain. Working with the federal government to issue open work permits when complaints are made and allowing anonymous complaints would alleviate some barriers to enforcement for migrant workers. Caregivers and agricultural workers must have equal rights to unionize: Unions are the most effective way to ensure fairness and democracy in workplaces. Yet agricultural workers and caregivers – two industries that are rife with abuse – are excluded from the Labour Relations Act and thus have no effective way to unionize. We urge government to accept the recommendations of the Special Advisors and end these unfair exemptions. There is no reason to delay this step to a separate “exemptions review” process. Millions of workers (and their families) in this province are waiting to see how your committee will pave the way to strengthen Ontario’s archaic labour laws. We are calling on you to reject suggestions that will make work more precarious, under the guise of enabling flexibility for the kind of business practices that continue to exert downward pressure on the wages and working conditions of all of us. The bulk of evidence shows that decent work is the foundation of a strong economy, better health outcomes, and reduced inequality. 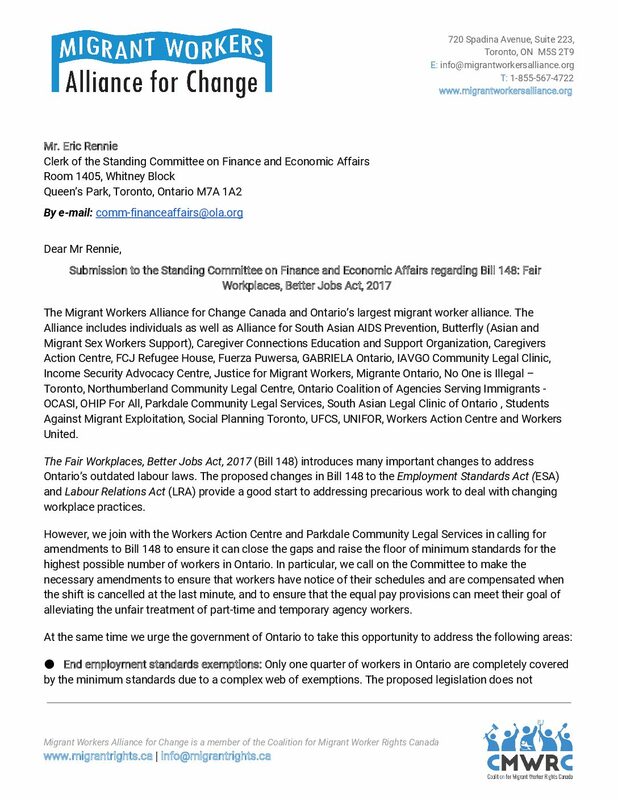 The Migrant Workers Alliance for Change also fully supports the recommendations and amendments put forward in the submissions by: the Workers’ Action Centre, Parkdale Community Legal Services, and the Ontario Federation of Labour as part of the Fight for $15 and Fairness. This submission was written by Fay Faraday, a member of Migrant Workers Alliance for Change and part of the Equal Pay Coalition. You can download and read the submission here. 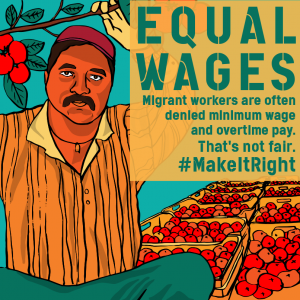 Migrant workers earn low wages and have work permits tied to one employer. This creates a context of rampant abuse and exploitation. Yet they are legally denied the right to unionize and collectively bargain. 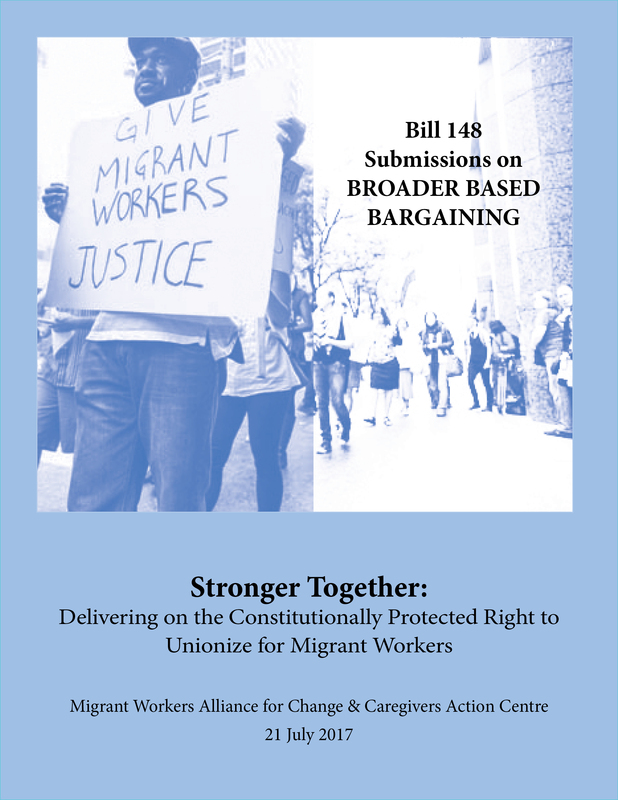 Despite the recommendations of the Changes Workplaces Review, the current proposals in Bill 148 do not address or correct the the denial of these fundamental rights to migrant workers. We are demanding that the exclusion domestic workers, agricultural workers and horticultural workers from the Labour Relations Act must be repealed. We also demand that the Labour Relations Action be reformed to enable broader based bargaining where migrant workers are employed. For more information about this submission, contact info@migrantworkersalliance.org. It is vital for migrant workers, advocates and allies to support Bill 148 and highlight how it will impact migrant workers in Ontario. At the same time, migrant workers need far more significant changes to ensure decent work. 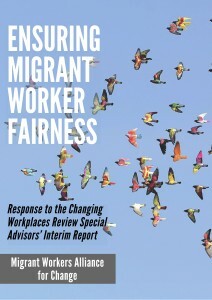 Read our blog and our written submission for facts and analysis about the impacts of the changes for migrant workers. equal pay for equal work (which will benefit seasonal workers). 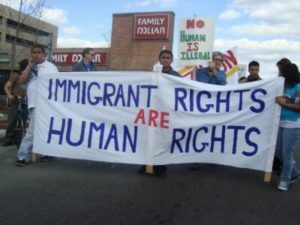 While more changes are always needed to protect migrant workers around better enforcement, their ability to collectively bargain and more paid emergency leaves, we can support the immediate progressive changes and still mobilize to improve them. But we also need to push back against the backlash, which has been intensifying. Your latest story on the impacts of raising the minimum wage neglects one important sector of workers. These workers are often invisible yet they contribute significantly to our economy. They might be harvesting our food or caring for our children and elderly. This work is vital to the functioning of our society, yet these workers are some of the lowest paid workers in Ontario. Not only do they perform hard work for low wages, but their immigration status puts them in positions of exploitation and abuse. I am speaking of the almost 200,000 temporary foreign workers that work and live in Ontario. Many commentators are talking about how the changes of the bill will help precarious workers. This is absolutely true for migrant workers. The changes will help a sector of workers that are mostly people of colour trying to lift their families out of poverty. The proposed changes would not only help with wages, but also protect migrant workers if they are sick or need to leave for an emergency. While the bill doesn’t solve everything, it’s a step in the right direction to raise the dignity and working conditions of the people who grow our food and care for our children and elderly. Migrant workers are important people in our community – their work sustains our health with the produce we consume. They provide care for people most needing care in our society. By supporting the changes to the bill (and fighting for more), it will create more stability and security for the most marginalized in our workforce. Writing or calling your MPP is the best way for them to hear from their constituents. Write or call your MPP to ensure they support the changes and even push them to fight for improvements. To find a list of MPPs, go here. To find out which electoral riding you are in, enter your address here. More Paid Personal Emergency Leave Days. Many migrant workers are at risk of losing their job if they are sick or need to attend to a personal/family matter at home. While having 2 personal emergency leave days is a good start, having seven will help the most precarious workers whose family live outside of Canada. Use the hashtags #MakeItRight, ##15andFairness and ##ONPoli on Twitter and Facebook. Don’t forget to mention any MPPs you want to direct your Tweet. Don’t forget to tag us on Twitter and Facebook if you are using social media. 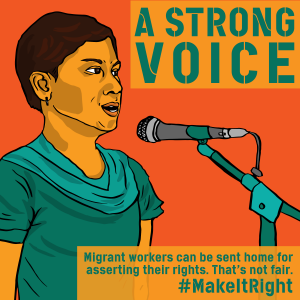 And send a copy of letters to MPP’s and newspapers to our email info@migrantworkersalliace.org. For more information on organizing around the hearings and writing a submission, please check out the Fight for $15 and Fairness campaign. 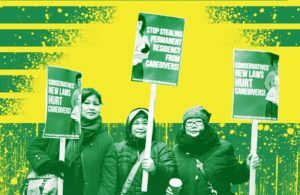 Long hours of work for little pay, the inability to take time off of work when personal emergencies arise, fear that speaking out about abuses will lead to deportation – these are the kinds of working conditions faced by many of the 200,000 temporary foreign workers in Ontario. The proposed changes to Ontario’s labour laws found in the Fair Workplaces, Better Jobs Act (or Bill 148) have the potential to hugely impact their lives and well-being. So how does the proposed Bill fare in terms of the lives and workplaces of migrant workers? The Bill takes some important steps to address migrant worker precarity, including progress on personal leaves, and equal pay for temporary and part-time workers. A proposed $15 minimum wage is a cornerstone of this legislation and an important step towards lifting migrant workers out of poverty. Migrant workers are amongst the lowest paid workers in Ontario. They are a disposable workforce of predominantly Black or people of colour, whose skills and lives are seen as having little value. Poverty in Canada is directly tied to poverty abroad. Migrant workers come to Canada in the hope of escaping poverty and despite their low wages, they send large portion of their earning back to their families. Ten days job protected personal emergency leave – two of these days will be paid. Employers cannot require medical notes when you are off sick. Equal pay for equal work for seasonal workers – those seasonal workers that are doing a similar job as a full-time or permanent employee will be entitled to the same pay. This also applies to part-time, temporary agency and causal workers. Three hours of pay for cancellation of work shift with less than 2 days’ notice and the right to refuse a shift scheduled with less than 4 days’ notice. End exemptions: Only one quarter of workers in Ontario are completely covered by the minimum standards due to a complex web of exemptions. The proposed legislation does not address these exemptions, instead leaving the issue to a promised review in the fall. Many migrant workers fall within these exemptions. The Employment Standards Act sets the floor for the most basic workers’ rights – all workers should enjoy these rights. In the alternative, the legislation should strictly define the circumstances in which an exemption will be available. Caregivers and agricultural workers must have equal rights to unionize: Unions are the most effective way to ensure fairness and democracy in workplaces. Yet agricultural workers and caregivers – two industries that are rife with abuse – are excluded from the Labour Relations Act and thus have no effective way to unionize. We urge government to accept the recommendations of the Special Advisors and end these unfair exemptions. 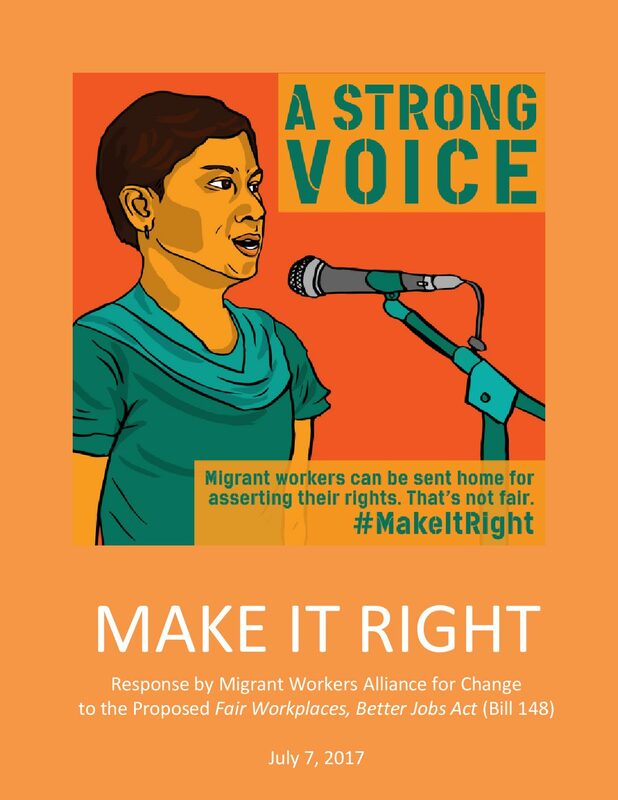 If you would like to help improve the working conditions of migrant workers, please go to Migrant Worker Alliance for Change for resources and tool kits. Click for more information on how you can help with the Fight for $15 and Fairness. There hasn’t been a comprehensive change of labour laws in Ontario in over thirty years. So we have a once in a generation opportunity to improve rights for migrant workers. According to the interim report just released by the Ontario government’s special advisors the cumulative costs of labour law exemptions and special rules for minimum wage, overtime pay, holiday pay, and vacation pay are associated with a potential loss of approximately $45 million to Ontario employees each week. The report released by the special advisors proposes options for change to laws – some of the options could hurt migrant workers, and some could greatly benefit them. The deadline for responses is October 14th. 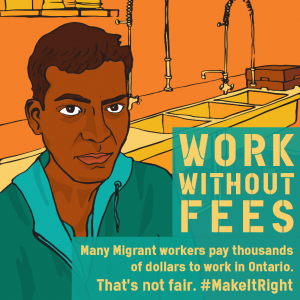 Now is the time for many of us to insist that migrant workers in Ontario must be included in all labour laws, and must be protected from reprisals and recruiter fees. To help you do so, we have prepared a template document that you can use to draft your own recommendations. Click here to download. You can also download a comprehensive analysis of the recommendations by Workers Action Centre and PCLS here too. At the very least, we encourage you to send the special advisors a letter urging them to accept our recommendations. We need to show that there is a large number of groups that want decent work for migrant workers. You can download a sample letter here. Just cause protection: We can ensure that migrant workers aren’t fired without cause. Migrant worker specific anti-reprisal protections: Employers can repatriate (deport) migrant workers if they complain. Only 22% of reprisals complaints go through, but the percentage for migrant workers is far lower, we can change that. Proactive enforcement measures: 61% of migrant worker employers inspected in the most recent Ontario Minister of Labour blitz (June, 2016) were found to be breaking labour laws. This while Caregiver employers were not inspected at all. We can expand proactive enforcement measures. At the same time, we will continue to raise our voice to call for an end to all exclusions and ask for comprehensive recruiter regulations. Migrants Workers Alliance for Change (MWAC) is organizing Member of Provincial Parliament (MPP) visits for constituency week Nov 4th– 10th 2016. There is an opportunity right now to push the Ontario governments to make meaningful changes that are needed to ensure justice and dignity for migrant workers. The Changing Workplace Review is making recommendations to ensure that laws about employment and unionization meet the needs of all workers, especially those in the most precarious jobs. We need to make sure that laws are introduced that address the particular barriers to workplace safety and fairness faced by migrant workers, including regulating recruiters and ending the exclusions from minimum work standards and collective bargaining. Visit your local Member of Provincial Parliament! Register to visit your local MPP below. We want to make sure that a delegation meets with MPPs across Ontario during the next constituency week: November 4 – 10. Once you have registered, please contact your MPP and request an appointment on November 4th, or November 7th to the 10th. An in-depth training 2pm – 4pm, Monday, October 24th to help you with how to organize the meeting, who should attend and what to say. We will come right to your computer! Register below. Migrant workers are part of our communities, where they live, work, shop and build relationships. They are not “foreigners”, they are part of Ontario’s work force, and they are part of our labour market. Their participation in our decent work movement is crucial to our ability to win. Unfortunately, bad employers and some journalists have pitted migrant workers against unemployed and underemployed Ontario workers. But instead of fighting at the bottom of the barrel for bad jobs, we must unite to increase rights for everyone and improve all our working conditions. Most migrant workers are in jobs that they have done for generations. Domestic workers have been coming to Canada since the 1800s, and this is the 50th year of the Seasonal Agricultural Workers Program. This isn’t about a short-term labour shortage, migrant work is permanent, and it is time they have the same rights as everyone else. Migrant workers work some of the most dangerous and difficult jobs in Ontario, with some of the lowest wages and protections. 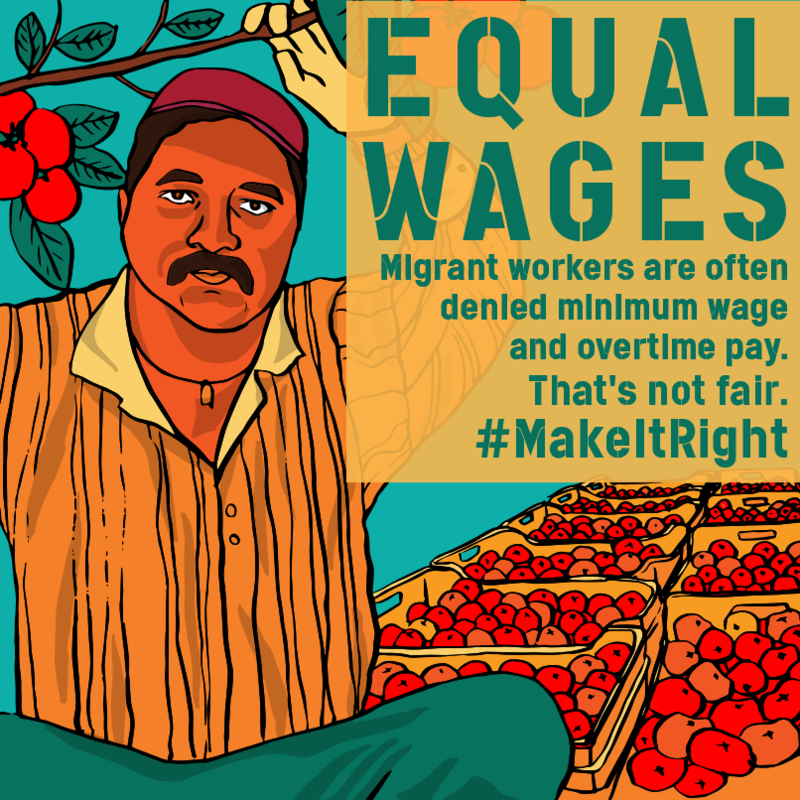 Migrant workers deserve the same rights as everyone else. There should be no special rules and exemptions by occupation. Labour laws must be proactively enforced and community members must be able to complain about bad bosses. Migrant workers need special anti-reprisal protections including their staying in the country while their complaints are being processed. Agriculture workers and Caregivers must be able to unionize and bargain collectively and sectorally. There should be no fees for work. Recruiters need to be licenced and migrant worker employers registered. These registries need to be public. Employers and recruiters need to be jointly financially liable for all fees paid to work by migrant workers. Joint liability must include any fees paid at any point in recruitment process. To understand how the gender wage gap affects women migrant workers it is important, first, to understand who women migrant workers are and what are the social dynamics that characterize their precarity in Ontario. Second, it is important to understand the legal frameworks that institutionalize their precarity in ways that very predictably leave them subject to intense gender discrimination, wage theft and other rights violations that deepen the wage gap. Third, it is important to recognize that these dynamics of systemic discrimination demand a response that is equally systemic and multi-dimensional. A wide range of changes need to be made and need to work together to eliminate the precarity that enables and sustains employer behaviour that impoverishes migrant women workers. In the case of agricultural workers, research and anecdotal evidence from our member organizations has shown that many women participating in the program are single mothers from rural regions who have limited economic opportunities in their home communities. (Encalada Grez, 2011). In the case of domestic workers, research and anecdotal evidence from our member organizations has shown that women are single mothers, or married but in either case are primary caregivers. Women migrant workers that we work with see labour migration as a survival strategy that provides opportunities to support themselves and their families that are impossible to access in their home contexts which are often characterized by unemployment, underemployment, underdevelopment, civil unrest and/or home governments that have actively adopted labour export policies as their dominant economic strategy. This effectively forces women into migration for work and produces a precarity that means women can be coerced into enduring profoundly discriminatory treatment because of their need to maintain the employee relationship while in Canada. Research found that women in agriculture try to keep their jobs in Canada by increasing their productivity, attempting to outperform men and sometimes acquiescing to exploitative and sub-standard working and living conditions (Encalada Grez, 2011). While in Canada, employers exert an astonishing intrusive degree of surveillance and supervision over women migrant workers’ non-working time. This surveillance and supervision exceeds even that imposed on male migrant workers and includes imposing stricter curfews, asserting greater control over their living conditions, and controlling social interactions. Romantic relationships are sometimes explicitly prohibited via contracts, and often implicitly prohibited. Pregnancy may result in termination or preclude a worker from being invited back in to the program. Harassment and violence by male co-workers and male employers often goes unreported. Harassment and violence as a result of the joint nexus of gender, racialization, and lack of permanent immigration status in towns, cities and communities where migrant workers are is also largely unreported. The cumulative effects of these constraints gravely impacts women migrant workers wages that are often paid below or at minimum wage, lower than both their male counterparts and Canadian citizens. As the Closing the Gender Wage Gap: A Background Paper notes, racialized women face a gender wage gap of 36.8%. Additionally, we are aware that migrant workers, most of whom are restricted to working in low-waged industries or unable to assert their rights as a result of being undocumented, earn the absolute least amount of wages. While we have not been able to do a comprehensive analysis of the wages of migrant workers vis-à-vis the broader workforce, it is certain that racialized women with temporary or no immigration status earn even less than racialized women in general. 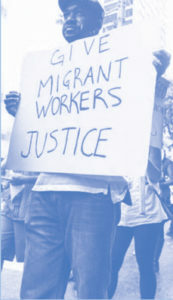 When looking at the legal frameworks, it is clear that the gender wage gap for women migrant workers is driven by a number of systemic dynamics that subject women migrant workers to low pay and that subject them to widespread practices of wage theft and other violations of workplace rights which deepen their wage disparity and isolation in the labour market. Here is a step-by-step guide to meeting with you MPP.